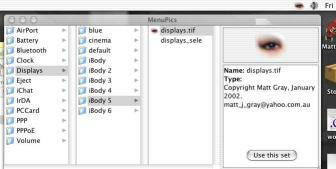 MenuPics does NOT work with Mac OS X 10.5 (Leopard). An update may be released at some stage in the future, but probably not before 2008. This program will allow you to easily change the appearance of the Menu Extras that appear in the top right corner of the screen. A few new images are included, and it is easy to make your own. Everything is done via a graphical interface - no need to use the Terminal. Download MenuPics 1.4.0(300k). This version is for use with OS 10.4. Last updated 25 Aug 2005. Download MenuPics 1.3.6(300k). This version is for use with OS 10.2 and 10.3. Last updated 02 Dec 2004. Download MenuPics 1.2(250k). This version is for use with OS 10.2. Last updated 1 November 2002. Download MenuPics 1.1 (500k). Use this version for Mac OS 10.1 Last updated 11th March 2002. Updated 25 Aug 2005. Version 1.4.0 has more pictures (by LW Brown and Claudio Hoecker). Updated 02 Dec 2004. Version 1.3.6 has more pictures for battery and iChat icons (by Pixel-Art). Updated 15 Nov 2004. Version 1.3.5 has more pictures (by Jens Luithle), and a minor bug fix in the interface. Updated 27 Feb 2004. Version 1.3 has more pictures (by LW Brown), and a minor bug fix. Updated 1 November 2002. Version 1.2 has more pictures (by Adam Lindley), fixes the battery menu for use with OS 10.2, has reduced download size, has some fixes for using new menus, and adds French localization (by Michel Pansanel). Updated 11th March 2002. Version 1.1 has more pictures included (some contributed by Hes Nikki), and fixes a window resize bug.